So I'll just show you a couple of "old friends" in new clothes. 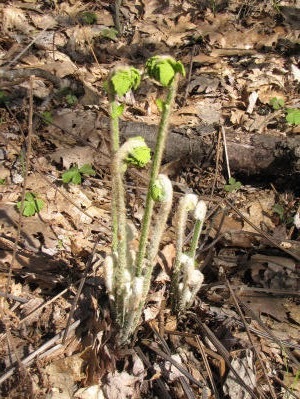 The first picture above is the fiddleheads for the Intermediate Fern- the one we used for a lesson on basic fern talk. How do I know? Because, remember that the old leaves remain through the winter, so I could still see them on the same plant as the new leaves. Here's another lovely set of fiddleheads, also called croziers. This one I was also able to identify because, again, last years leaves remain green all winter. In fact, this one is so dark green and shiny that it was often used for holiday decor, and is called Christmas Fern. 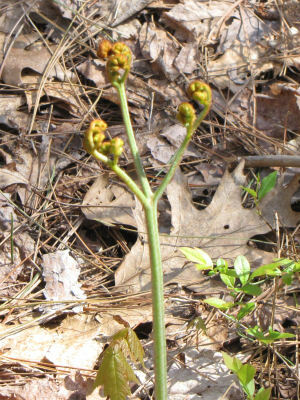 (Polystichum Acrostichoides). Here's a picture of it from another place and year, but you can see how pretty it is. After we looked at just about every plant on this trail, we took a fast hike to check on the tulip tree. How do you like this lovely baby leaf? It will be a while before there are blossoms. I hope I can catch them for you! 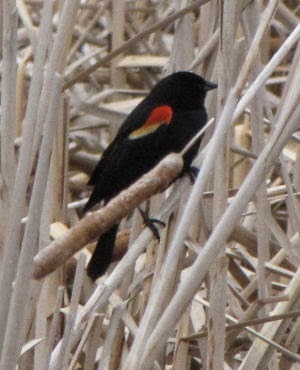 I went there because I'm leading two wildflower hikes there for the West Michigan Birding Festival in mid-May. Since I leave on Sunday to go to NY, I'll be home with just one day before I have to lead the first hike. I wanted to go see what kinds of things might be up, so that I might be able to predict some flowers that will be in bloom in a couple of weeks. I also wanted to check out a very old woods road that I plan to use to make a loop hike. It will need a little bit of clearing with a hand saw, but it's usable. So what I found was... not much. 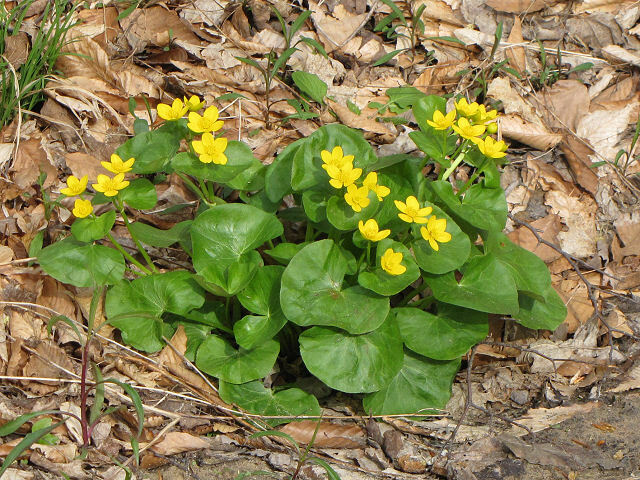 Despite all our warm weather, we've had so little rain that the flowers are not progressing very quickly in the woods. Several years ago, our trail club used this same loop for a nature trail, so I have a master list of all the plants I found there. But that was in June. I sure hope that a lot happens in the next two weeks! We can do a botany hike in any season or condition, but it might be disappointing in terms of the flowers! Anyway... that loop is very short. 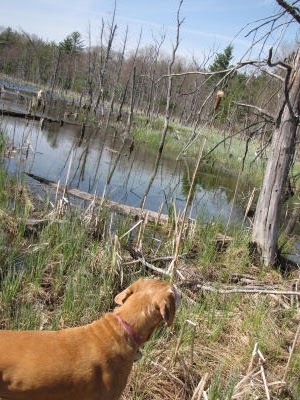 Maggie and I walked it in both directions, and it took less than an hour, even with hunting for sprouting plants. So I decided to explore another direction along a forest road that is a snowmobile trail in winter. In the pictures above and below, you can see what we found! 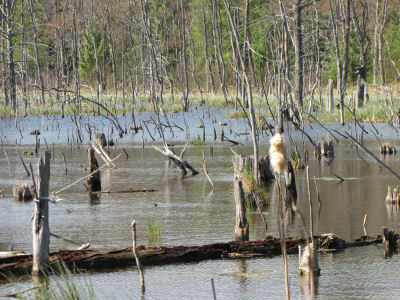 This is a wetland area of Tank Creek. I'm thinking that the water area will shrink considerably in the summer, but I sure plan to go back and look again. We followed the edge on a deer trail until reaching the north end, which I think is the headwaters of the very short Tank Creek. (It's only about 2 miles long and then flows into the Pere Marquette River.) I scared up some ducks, but they didn't come back to have their picture taken. I think they might have been mergansers. So what DID we find? Well, the ferns are starting to unfurl. This is cinnamon fern, Osmunda cinnamomea. It's very handsome in any stage. 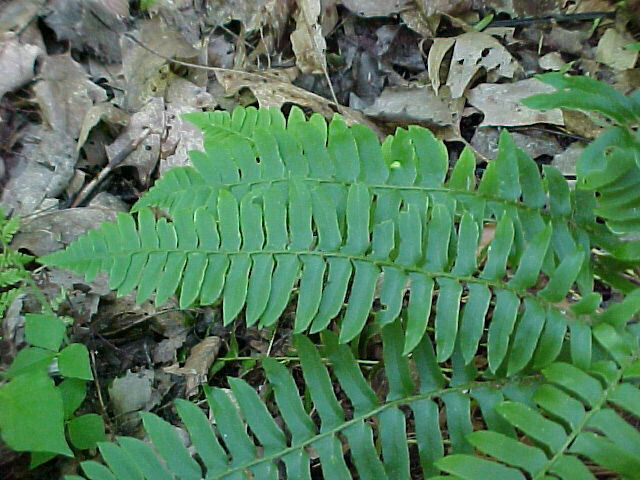 This one is just bracken, Pteridium aquilinum. We have so much of it, and it grows in so many places, that I don't find it very interesting. But, it can be attractive. I also found some of the little Woodsia Fragile Fern that grows in my cemetery. Tomorrow, Ellen and I are going to check out another trail because I'm leading a wildflower hike for the Audubon Society on Saturday. I think that one is doomed to be a "botany" hike, but I'll let you know tomorrow! The rules this month are easy. Identify each picture. Most of them are closeups that may make it tricky to "see" what it is. Three of them are animals that I have previously shown you... you just have to know/ remember/ look them up. Anyway, more correct information will work towards breaking ties, but of course, more incorrect information will not help you. So it's up to you how detailed to make your guesses. Email your answers to jhy@t-one.net before midnight Sunday, May 2, 2010. This is the second installment in Dogs of my Life. Meet Butchy Boy II. While Butchy Boy I began as my parents' dog and ended up as mine, Butchy Boy II started out belonging to me, but essentially ended up being my parents', as I went away to college. After first Butchy died, I wouldn't even think about another dog for months, but by winter I was more than ready for another canine friend. But I was a child who did not like change in any form. The "new" dog had to be black and white, male, and was going to be named Butchy Boy. A girl in my class said that they had puppies, but she lived w-a-a-a-a-y out in the country. She rode Bus #12 to school... Bus #12 was often late to arrive. If the weather was bad, Bus #12 was dismissed early. Sometimes, Bus #12 students never even made it to school. 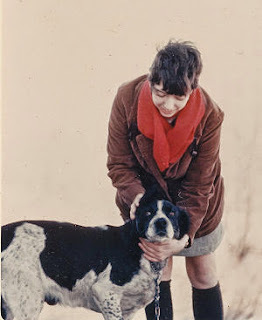 My mom was not thrilled to be attempting to locate the Cooper's house in the snow, but we finally made it, and I chose one small black and white puppy. We seem to have no pictures, however, until he was grown. 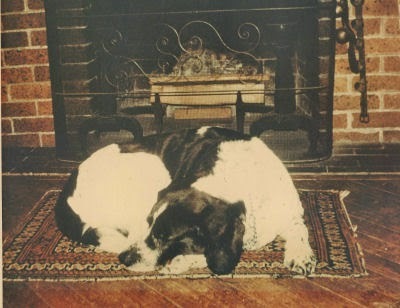 Second Butchy was reputed to be 3/4 English Setter and 1/4 Beagle. We can guarantee that he was pure Mutt. I don't recall that I was involved a lot with seriously training him. I think that Dad just was so used to that role, that he did most of the work, although I helped and "played" at dog training. The beagle part of Butchy's genetic makeup was strong, and Dad would always comment with mild disgust that he was just pure hound. He was definitely headstrong and not anything like first Butchy. This dog was fun to play with, but he would run away if he was allowed to run loose. He could easily break dog chains, so Dad found a cow chain in the barn. When Butchy was inside he was a good family dog. When he was outside, he had to be chained, and was equally comfortable in his dog house under the porch, insulated with hay. Here's my favorite picture of this dog. He looks quite peaceful. However, he was high energy, and really needed more exercise than even I could give him. 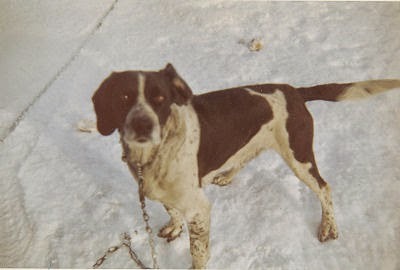 Throughout high school I got up early before school, most days, and took him for a run the length of our farm and back. One morning, Butchy chased a woodchuck down its hole. I let him go digging for it, and discovered that it wasn't a woodchuck that had ducked underground! Butchy caught the spray right in the face, and I was close enough that I had to go to school with some pretty unpleasant perfume. Yes, it was a skunk! When I went off to college, of course, I had to leave Butchy at home. He was lonesome, and would break his chain fairly regularly. Mom and Dad usually found him two miles away at the school, playing with the kids. Of course, that involved crossing roads, and on one of those adventures, he connected with a car. Mom found him, and brought him back to the farm to bury. As we continue this series, you will probably be appalled at the number of my pets whose lives were ended by cars. Buck up, and get prepared for it. I've always lived on major highways, and dogs just seem to carry their knowledge of the dangers of the road only so far. They will stay off the blacktop until they smell or see something attractive on the other side. Anyway, second Butchy was a good transition dog for me. I learned how to train a dog. I learned that not all dogs were going to be as special as first Butchy. It was verified that I am very much a dog person. I'll leave you with a quirk that should give you a chuckle. 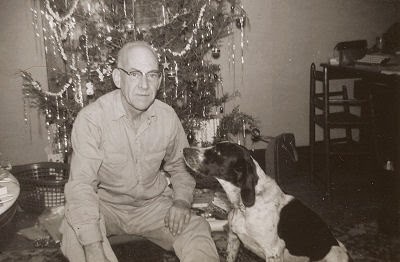 Whenever Dad was digging potatoes from the garden, second Butchy would bark and bark (he was chained on that side of the house), until Dad would throw him a raw potato to eat. Believe it or not, I leave for NY and begin the hiking season leading to my completion of the North Country Trail in (YIKES) 6 days. I spent the day working on food, and various other projects that need to be completed before I leave. I'm really tired tonight, and hoping that's just an anomaly, or it's going to be a really long summer. Next is a cousin, another member of the Ranunculaceae Family (Buttercups). There are over 300 members of this family. 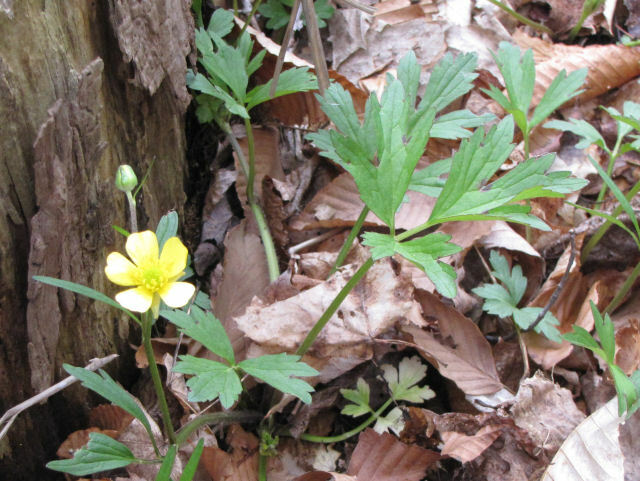 This is the swamp buttercup Ranunculus septentrionalis. 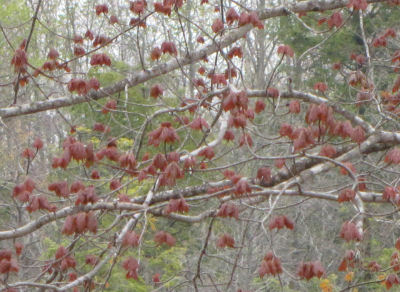 Last... just some lovely red maple leaves. They will be green in another week. I was going to show you several flower pictures today, but I'm getting bogged down in getting them up on the photo web site, and I don't want to let a little discovery slip by without mentioning it. But first, with some digital editing I can bring you a picture of Ellen and me from yesterday, together. We've also discovered that we share a love of poetry too. We got to talking more about poems for children and she pulled out a copy of A.A Milne's When We Were Very Young. That was one of the books that I had read to me, and then read myself, what must have been 1000 times. But I haven't looked at it for quite a few years now. Here's my discovery... So many of the same poems that I remember as my favorites still speak to me deeply now. Yeah, I know they were meant for children. But poems for children didn't used to use grade level vocabulary and word length. They use themes that speak to children, and are sometimes funny just because of their meter, but they sure aren't One Fish, Two Fish, Red Fish, Blue Fish (OK, I like that one too, but it's not the same). These are poems that use language. I would love to quote a whole lot of them to you, but I'm going to settle for one stanza of the poem "Spring Morning." Seems to still pretty much speak to who I am. I'll end with a picture of the common toothwort, Dentaria diphylla. It's a cousin to the cutleaf toothwort I showed the other day. Flowers pretty much identical, but look how different the leaves are. Just one final question to ponder... Was I shaped by the poems, or was I already programmed by age two or three so that certain poems were more or less destined to be my favorites? 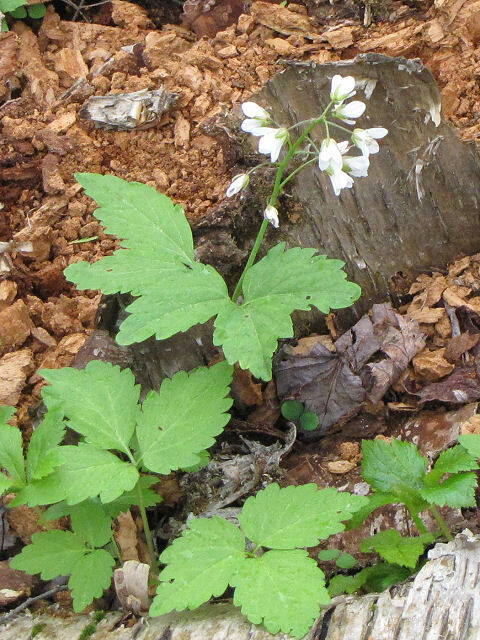 See More Flowers in the Cemetery Ravine for the cutleaf toothwort. This has to be one of the best birthdays! Ellen took me to a small county park called Gale's Pond. We were both very surprised that I hadn't previously known about it, but this was my first visit ever. 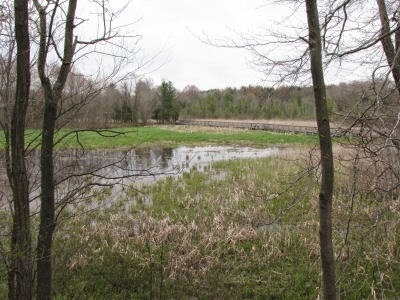 It was a former mill pond, and the property was donated to the county in 1939 for a park. More recently, Michigan Recreation Trust Fund money was obtained to build the boardwalk you see on the right side of the picture. The trail encircles the entire pond. There are numbered signs which must have an interpretive brochure but there weren't any in the box. Ellen and I made a game out of trying to decide what each post was supposed to mark. Rain was predicted all day, but except for a few showers before we headed out, the day was only gray, and very comfortable. 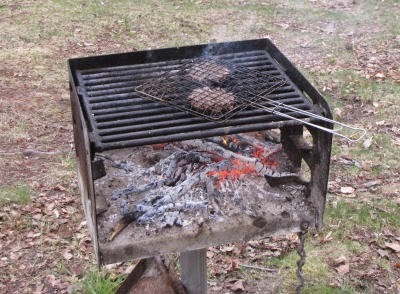 The little park had a grill, and we had no trouble building a little fire to cook some hamburgers. I took a bean salad, and Ellen brought pickled asparagus and brownies. That was a feast good enough for anyone! The trail was short, so we walked it three times, and also a very short nature trail that was around the corner, and built by Boy Scouts. We saw SO many things! I think I'll share some birds today, and save the plants for tomorrow. It's supposed to really rain tomorrow, so I may not get outside. 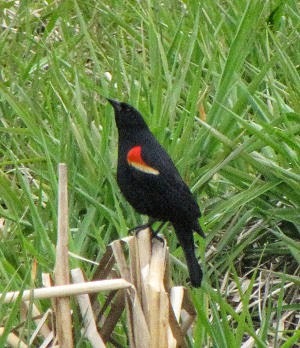 Redwing blackbirds love places like Gale's Pond! And it's spring, so these two fine fellows were trying really hard to attract the attentions of the various girls in the neighborhood. When I was a kid, we learned to identify their song as "Ok-a-lee, ok-a-lee, joy to you in the spring!" However you remember what they sound like, they were sure singing it today. And their efforts were not going unnoticed. Here is one of the potential Mrs. Redwings. 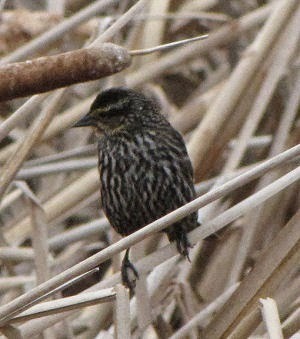 Ratty had a much better picture of one at Female Redwing Blackbird, but this one isn't bad. This is the first suitor stating his case. And here is number two, waiting for his chance to impress. They were a lot of fun to watch. They are so ordinary here, that it's easy to overlook them. I do have to admit to being a little more excited about catching the last picture though. It's not great... you can't see the bird's head. 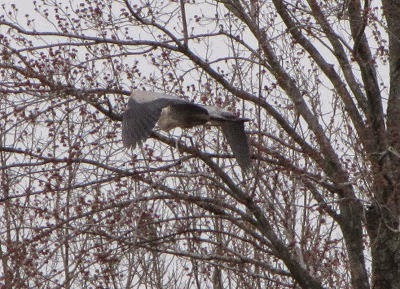 But it's the first time I've ever gotten a picture of a great blue heron in flight! 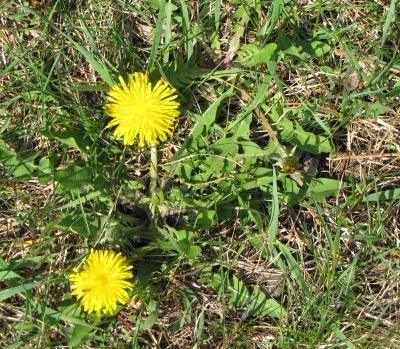 I thought you deserved to see a really good picture of the dandelion. So, this is where the project started. The picture below is where it ended up. I really like this syrup. It has a flavor similar to old-fashioned horehound candy, but lighter. It's really easy to make, but there are several steps, so the process takes a couple of days, but not much actual time. I've posted the recipe as an article at Associated Content. 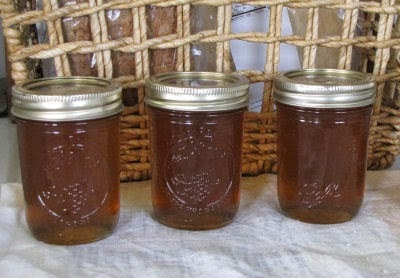 See Dandelion Syrup- a Delicious Option with Pancakes or Waffles. I would save the next part of this post for another day, but the good stuff is piling up, so I want to share it. I think I'll have something fun to share tomorrow because it's my birthday. Ellen and I are going on another excellent adventure. I'm really looking forward to it, since we are going somewhere I've never been before. 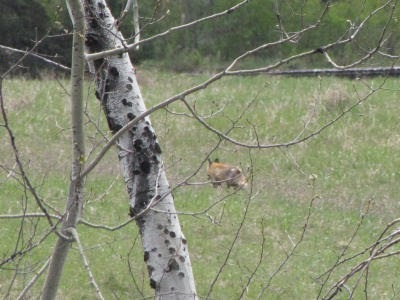 Do you recall that I've mentioned there is a fox that trots along my back property line? I've even showed you its tracks. Quite often, as I'm walking my trail, I can tell that it has been there before me from the musky odor. I've always assumed that the only way I would ever catch a glimpse of this animal would be to get up before sunrise and sit quietly back by the tracks waiting for it to come by. 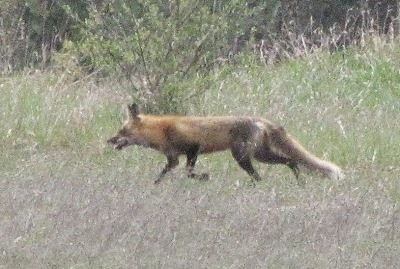 But this morning, as I was sitting at my desk working, I saw the fox! I had to pull the SD card out of the computer card reader, run put it in the camera, and run to the deck. Of course when I opened the door, Maggie started to bark. So much for my other canine friend. Here's what I saw after that. I figured that was all I'd get to see of my fox. But at least I got to see it. It seemed to me to look rather scruffy. I stayed on the deck a few minutes, but Maggie kept barking, so I didn't have much hope of it returning. And then! Back over the hill it came, and I learned why it looks scruffy. It's colored rather oddly. It almost looks like a hybrid of a red and gray fox. Red foxes are colored like the front of this animal with red hair and black legs. Gray foxes have more brown and gray like the back legs on this animal. 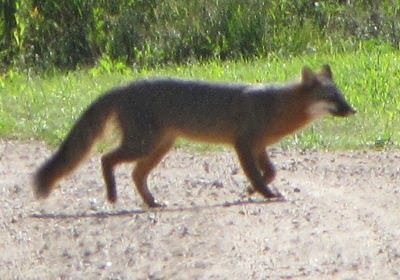 See a picture of a gray fox at Gray Fox Seen in Mason County, and also last summer in Minnesota below. Notice the following on the gray fox: more blunt nose, generally chunkier, white chin, black on tail. 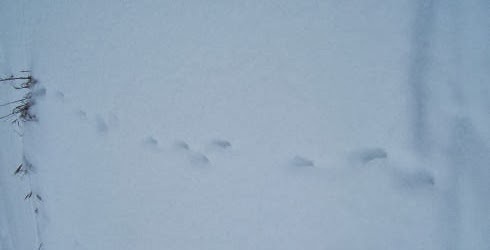 Note for red fox: pointed nose, sleek shape, black legs and ears, white on tail. The white on the tail, definitely says red fox though. 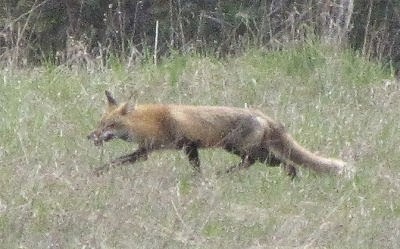 I'm quite sure it's a red fox, but the overall effect is more piebald than I usually expect to see. OK, this is a lot of pictures, but I like the last one I caught today as my little friend (well, he's pretty good size for a red fox), started to trot. Finished 2 draft pages for Moose in Boots (I have just one to go, and a few tweaks on pages already "done." So unless I really mess up, I will make my goal to have this step done before the hiking starts. Edited and turned in the story for this month's Accentuate contest- theme: Anger, name: Toby and Harry. Have I mentioned over here that I've also started another blog: Shark's Short Story Reviews? I'm trying to do about one entry a week. I feel that I can promote my book and other writings a little more aggressively on a blog related to writing.